Just over a week ago, I decided it was time to carve out an office space for myself. It’ll be some time before we can add on a sunroom, and I’d been a kitchen table nomad for too long. So that day, I bought a desk and office chair, cleaned out a corner of the basement, and put everything together (with help from Pete, of course). When I make a decision, I don’t waste time. Anyway, Foxxi decided to check out what we were up to. She bounded down the stairs as usual, curled up under my new desk, and … started bleeding. Freaky! I called our neighbor (a vet), who turned out to be at the emergency clinic where she works. She said to bring Foxxi in, so we did. All four of us. I held the dog and tried not to get blood everywhere. 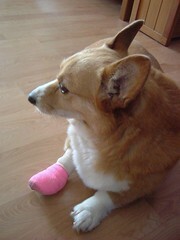 Two hours later, we went home with our bandaged up pup. She had snagged a claw on the stairs’ carpet, and pulled it most of the way out. Our vet neighbor gave her a painkiller and removed the claw. (It’ll grow back.) Foxxi got her share of spoiling afterwards. She also was a bit reluctant to go back to the scene of the accident. Poor baby! And she didn’t yelp when it happened?